Our standard painted finishes are: blue, medium or dark bronze (matches Duranodic #312 & #313), off-white, matte-black, satin aluminum, forest green, red, bright white or gold. Our painted finish system consists of an acid etch primer, catalyzed polyurethane painted finish and protective clear coat. We have had our painted finishes tested by the leader in paint testing – Q-lab – with accelerated weathering, light stability and corrosion testing. Special finishes are also available: Custom color matches, Verde Green, Copper Patina, Gold Leaf and brushed, circle-line or polished finishes over the base material. If you have a special finish not listed here, please contact the factory. Please note that printers and monitors may distort the colors. What is a rod tail on a (tower clock) clock hand? A rod tail is a cylindrical extension on the end of a clock hand, used to counterbalance the clock hand. Typically it extends from the center of the hand to the end or tail. In many cases it’s finished to match the color of the clock dial that it is mounted over, alternatively, it’s the same color as the body of the clock hand. In some special cases, it has a special finish, such as polished brass. Clock hands are balanced to alleviate excessive wear on the tower clock movement. Clock hands can also be balanced using hidden counterweights on the tails of the clock hands. The object of balanced clock hands is for the center-to-tip portion of the clock hand to weigh the same amount as the center-to-tail portion, thus being perfectly balanced at the point where they are attached to the clock movement. Tower Clock hands with tails same color as the body of the hands. Do you carry parts for Telechron Tower Clocks? Yes, we have replacement parts, motors and movements for Telechron and Warren Telechron tower clocks and street clocks. This includes motor replacements for type B3, C5 and C5M rotors used on B28, C1, #4, #5 and #7 tower clock movements respectively. How do I get pricing? Please contact us via phone 508.359.4396, email salese@electrictime.com, our info request form, or the request info form tab on the product you are interested in pricing. We will get right back to you with prices and/or a price list. Are your products listed to UL standards? Yes our tower, street clocks and automatic controls are listed in their entirety under various UL standards. Members of our engineering staff serve on a UL standards committee. Is UL recognized the same as UL listed? No. Manufacturers often claim that products containing UL recognized components and UL listed parts have been properly certified as safe. This is not the case, in order for a product to be “UL Listed” it needs to be evaluated in the entirety under the applicable UL standard. Electric Time Tower & Street clocks and controls are listed under UL standards applicable to the specific product. What are the advantages of aluminum over fiberglass ? Fiberglass can be molded into shapes or forms that are not practical in metals and the molds for fiberglass cost 1/10th as much as for aluminum. However, aluminum will not develop cracks with age and will not deteriorate when exposed to the elements without a protective finish. 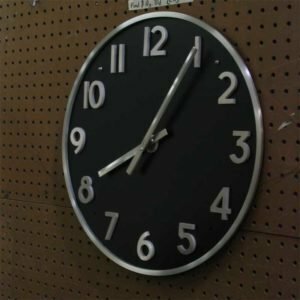 Electric Time Street Clocks are completely cast in aluminum for longevity. We do not use fiberglass to save money. Photograph of inside of fiberglass post clock with crack. How accurate is your automatic control, Type 99B? Without GPS: Yearly, when control located indoors +- 1 minute, outdoors +- 3 minutes. With GPS: 1 microsecond 1×10-6. How do you light clocks dials ? We use a variety of different methods to light both our tower and street clocks with LEDs. 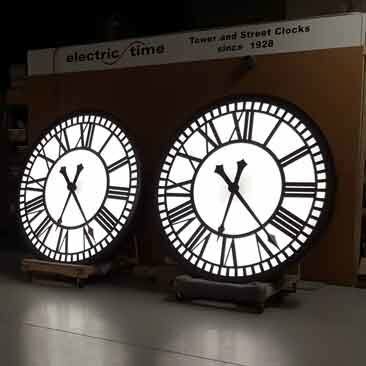 Our standards include backlighting, and edge lighting, we also can provide halo and surface mount lighting on clock hands and dial markings (see products & specs – 1000/1100 Silhouette – Illuminated ). Our backlighting is even, with light sources spaced back from the clock face to eliminate hot spots. Various options are available, ranging from dimmers, RGB (color changing), and warmer and cooler whites, contact us for details. What is the motion of your clock movements ? Our tower clock movements are “Pulse” driven – they run 6 seconds of every minute. The motion is smooth, not jerky, and used on clocks up to 35 ft. in diameter. This tower clock movement design is backwards compatible both electrically and physically with tower clock movements we have been making for the last 70+ years. Synchronous movements are also still available from our firm. How do you attach your clock hands to the shaft of the clock movement ? All of our clock products use split hand hubs to attach the clock hands to the shafts. We do not use set screws as they will loosen with time. This prevents the hands from becoming loose in strong winds and/or adverse weather. Post clock controller where do you mount it? The Howard and Seth Thomas Street Clocks have a controller mounted in the base. 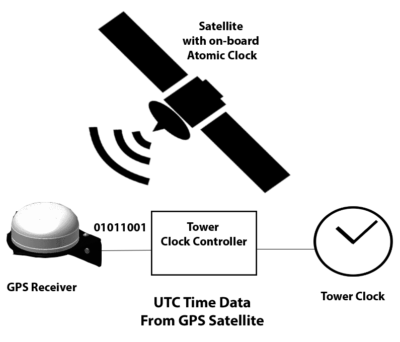 This control will automatically reset for Daylight Saving Time changes and power failures and kept accurate with a GPS receiver. It is listed under UL standard 863. It is not necessary to have a large industrial exterior cabinet to house the control. 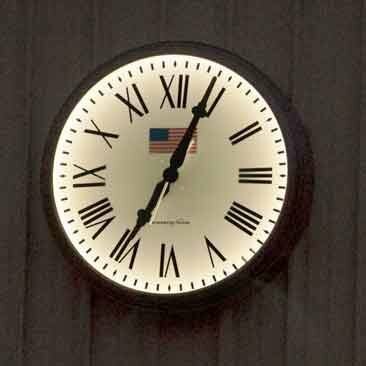 Why do some clocks use Roman Numeral IIII? There does not seemed to be a definitive reason why the number four is represented by IIII rather than IV, but it is how the dials on tower clocks have been done for centuries. For further commentary, please see this document by Don Lathrop, or Wikipedia. What are Castings and Why do we use them? Our aluminum castings are made here in the New England area at local foundries. The foundries use our wooden patterns to make the castings. Pictured below is the progression of the process. 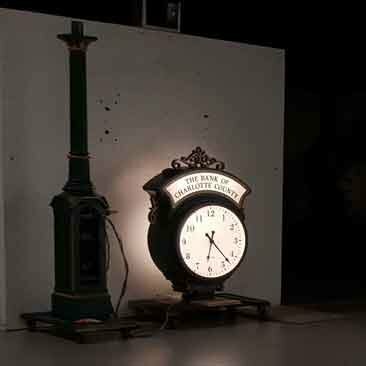 At far left is our original Howard Company wooden pattern used exclusively for the post in Electric Time Company’s Large Howard Replica Post Clocks. The photo second from left shows the post as it arrives in our factory from the foundry. After going through a number of processes in the factory the finished results are shown on the two photos at right. The casting process starts with the wooden molds which are pressed into wet sand that will hold the mold’s shape. The molten aluminum is poured into the mold – which is also modified using a core box for the inner shape of the cast piece. These cast pieces are manufactured to our strict specifications for purity, thickness and strength. Electric Time Company uses aluminum rather than fiberglass for its street clocks. Aluminum provides a stronger, sturdier clock – not likely to need any repairs or upkeep. 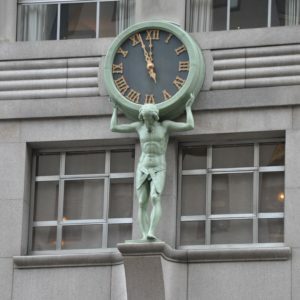 Fiberglass is a less expensive medium, but not one we prefer for our post clocks.